Get great discount on Fujifilm S2980 Point & Shoot Camera | Online India shopping best deals, discount,coupons,Free offers. From Fujifilm’s popular and high performance FinePix S series is this S2980 bridge camera. A bridge camera is one that finds the middle ground between a point-and-shoot and a DSLR, which makes it an ideal choice for those looking to make a gradual and a well-informed switch from a simple compact digital camera to a higher performance level. Featuring the renowned Fujinon 18x optical zoom lens, this camera has a focal length of 5 mm – 90 mm or a 35 mm equivalent of 28 mm - 504 mm. This long range optical zoom capability is coupled with the advent of 6.7x digital zoom giving the FinePix considerable levels of magnification. Operating through a powerful CCD image sensor with primary colour filter, the camera has an optical sensor resolution of 14 megapixels. As with most of the modern bridge cameras, the most noticeable factors are the long range zoom along with its shape and size-wise resemblance to a DSLR. This keeps the overall weight of the S2980 at 437 g including the batteries and the memory card. The CCD image sensor along with the 14 megapixel optical resolution, this FinePix camera is capable of HD Video recording with 1280 x 720 pixel resolution at 30 fps with monaural sound. The S2980’s large 3 inch bright LCD display makes it easy to compose great photos and view captured images thanks to a high-impact 230,000-dot resolution. The advent of a 0.2 inch Electronic Viewfinder offers the flexibility of framing your shots through this electronic viewfinder or by using the 3 inch LCD as a live viewfinder, giving you a variety of shooting experiences. Battery and Storage This high performance bridge camera is powered by 4 AA alkaline or 4 rechargeable Ni-MH batteries which supply the camera with power for up to 300 and 500 shots respectively. This FinePix camera can capture images with a maximum resolution of 4288 x 3216 pixels stored in the JPEG (Exif ver 2.3) format while all the recorded videos are saved in the AVI (Motion JPEG) file format. All the captures images and recorded videos are saved in an SD or SDHC memory card. These saved media files can easily be transferred to a PC or a laptop through the camera’s high-speed USB 2.0 digital interface. This camera also features a composite AV out which supports both NTSC and PAL compatibility along with a HDMI Mini connector. This gives you the option to enjoy your images and videos on a standard or a high definition television. Performance The aperture control on this bridge camera has a range of f/3.1 - f/5.6. Working through the TTL contrast detection autofocus system, the S2980 possesses a normal focusing range of 40 cm – 8 m (Wide) and 2.5 m - 4.4 m (Tele). There is the macro focus function with a range of 30 cm along with a highly useful Super Macro mode with an amazing 2 cm range, which together gives you great focusing accuracy and flexibility so that even tiny subjects can be captured with all their detail. 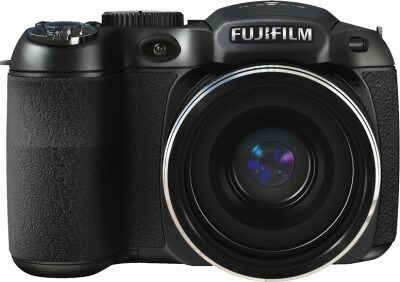 This Fujifilm bridge camera has an available shutter speed range from 1/2000 sec to 8 sec along with a light sensitivity or ISO speed that ranges from ISO 64 to an astonishing ISO 6400 gives this FinePix bridge camera amazing capabilities to shoot anything from fast moving subjects to dramatic night shots. A built-in pop-up flash with an operational range of 40 cm - 8.0 m (Wide), 2.5 m - 4.4 m (Tele) further enhances the low light capability of the FinePix S2980 digital camera. Features The presence of pre-programed white balancing modes along with a number of shooting modes let you capture images in a variety of image temperature and colour tones. The S2980’s CCD shift Image Stabilizer makes sure that all your recorded images and videos appear as clear and blur-free as possible. The S2980’s Face Detection functions make it easy to shoot perfect portraits and group shots without red eyes with the help of the on-board Red Eye Reduction technology. . The availability of PictBridge technology allows you to connect the camera directly to a printer without a PC, enabling easy direct photo printing. The Self Timer function on this bridge camera has a 2 sec and 10 sec delay while the continuous mode allows it to shoot at a maximum rate of 8 fps, giving you very flexible shooting options..The product Fujifilm S2980 Point & Shoot Camera is from the famous brand Fujifilm. The product is currently available with the amazing discount from FlipKart.Currently a discount of 36.0% available for this product. Great discount for this product which has the original price of Rs.13999.0 and you get these amazing products for a discounted price of Rs.8888.0. Hurry up. Stock may be limited.